Growing faster than any other segment of online advertising, online video advertising generates hundreds of millions of dollars in revenue each quarter for publishers from major media companies to special-interest websites. 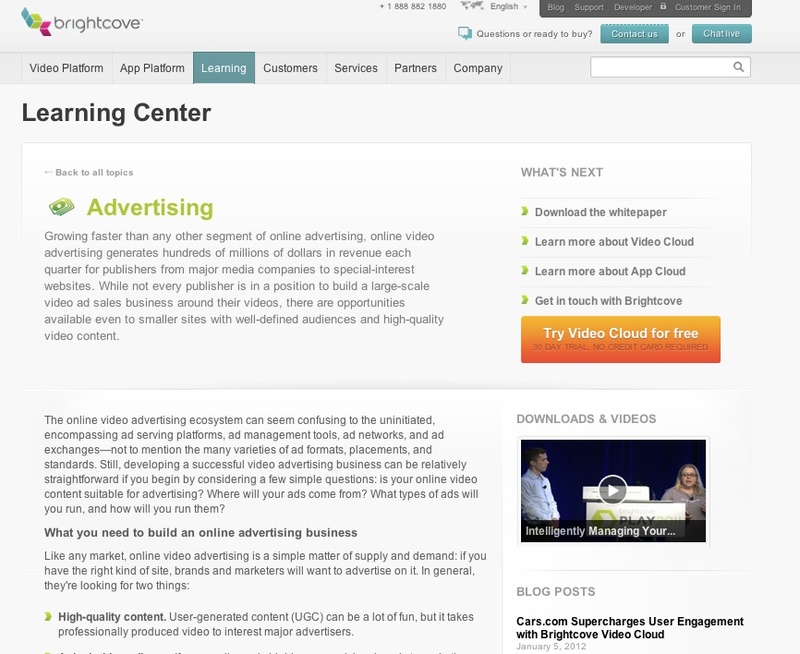 With this in mind, Brightcove is excited to launch a new Online Video Advertising page in the Brightcove Learning Center that is built to serve as a resource for video publishers at all levels who are looking to monetize their online video content. The online video advertising ecosystem can seem daunting to many, as it encompasses ad serving platforms, ad management tools, ad networks and ad exchanges, not to mention the variety of ad formats, placements and standards available. The Online Video Advertising Learning Center addresses these issues to provide visitors with a thorough overview of the ecosystem and identifies key questions that publishers should address when trying to develop a successful online video advertising business. Key questions addressed include is your online video content suitable for advertising, where will your ads come from, what type of ads will you run and how you will run them. To learn more about online video advertising -- including opportunities and strategies for monetizing your video content across non-PC devices like touchscreen smartphones, tablets, Connected TVs, and over-the-top devices -- we encourage you to download our free, in-depth whitepaper, "Online Video Monetization Made Simple." And keep checking back to the Online Video Advertising Learning Center page for the latest strategies, technologies, and best practices for your video advertising business.